Astronaut Ice Cream 5 Pack | Tantalise your taste buds! With the Astronaut Ice Cream 5 Pack you get five times the indulgence, have it for lunch or eat it the next time you go into orbit, just like a real NASA astronaut! 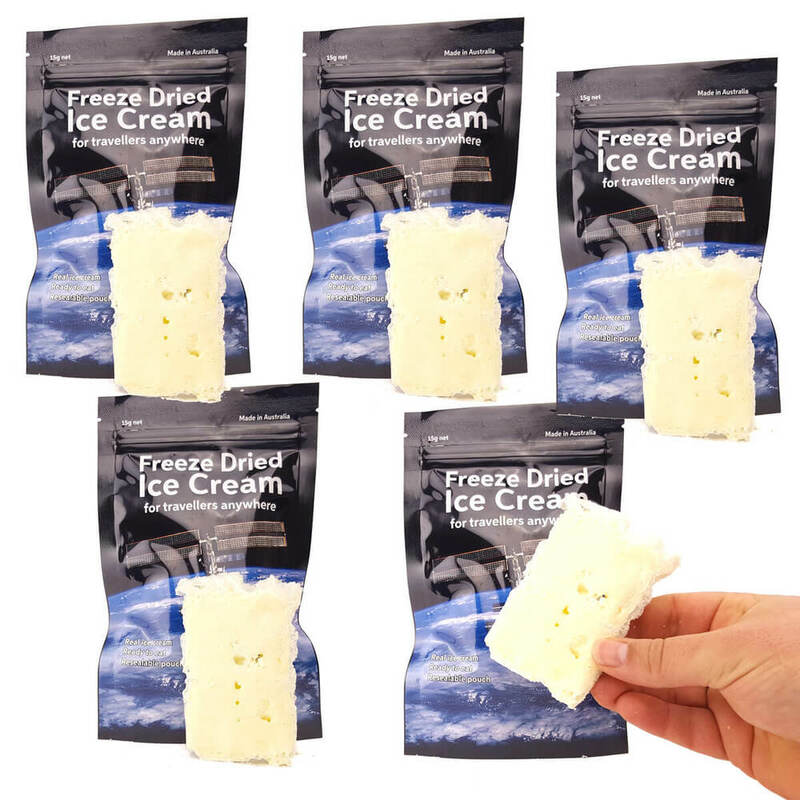 This cool snack is real ice-cream that has been freeze-dried ready for eating straight from the pack. No water or refrigeration necessary! It even comes with a Certified Space Technology Insignia on the packaging to indicate that it is from the same range as other freeze-dried food items used on NASA missions today! It comes complete with three flavours (chocolate, vanilla and strawberry) to tantalise your taste buds. Milk fat, corn syrup, non-fat milk, strawberry puree, whey, cocoa, stabilised and emulsified by monodiglycerides, guar gum, cellulose gum and carageenan, artificial flavour, red #40 and vegetable annatto colour. Please note: Contains milk, may contain traces of peanuts, soy, gluten and tree nuts. I bought the icecream for my class to inspire them to try something new, experience something a real astronaut would have done and to see their faces while they were eating ! The icecream was excellent and the kids loved it. Ordering and delivery was simple and fast and I can’t rate Cool Things highly enough. I first had Astronaut Icecream when I was a kid at the World Expo 88! I saw this on your site and had to get some. I'm really happy to say that it hasn't changed at all and it's exactly how I remembered it. Thanks for helping me be 12yrs old again!